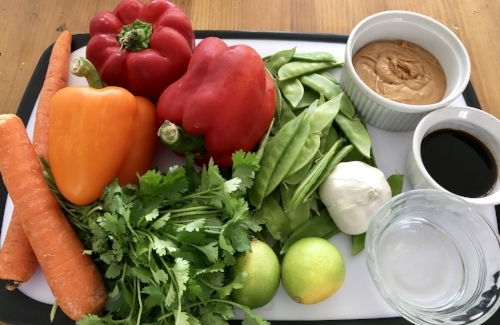 You can use whatever veggies you like or have on hand but in my opinion the snow peas and red/orange peppers are a must. Garnish with cilantro and chopped green onion and serve with basmati rice or just as is! Heres what you need... for a double recipe. 8-10 boneless skinless chicken thighs, a couple of carrots, 3-4 red and orange peppers, snow peas, garlic, limes, soy sauce, natural peanut butter, white vinegar and brown sugar and cayenne pepper (not pictured). I also added cilantro and green onion. I doubled the recipe and used 8-10 boneless skinless chicken thighs. I get in there with kitchen shears and cut out as much of the yellow and white fat as possible. Brown 4-5 minutes on each side in a skillet with 2 Tbsp of oil. Add the carrots and peppers and cook with the chicken until chicken is done (165 degrees) remove from the skillet and set aside. 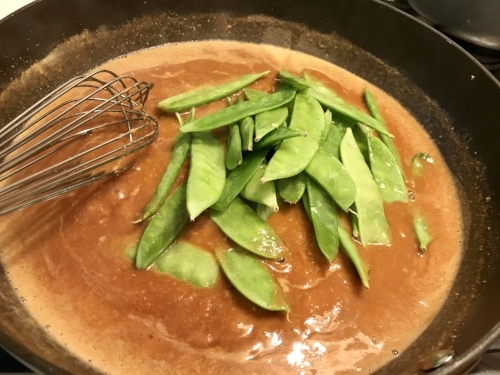 Make the sauce: Combine the vinegar, soy sauce, lime juice, peanut butter, brown sugar, water and garlic. Bring to a boil and then reduce to a simmer. Add cayenne pepper to your liking. I add the snow peas here instead of steaming separately. Otherwise, it's not a true one pot meal!! Add the chicken and veggies back to the skillet and simmer 3-5 minutes. Lastly, enjoy your yummy, easy, healthy creation while sipping on my new favorite flavor of sparking water. 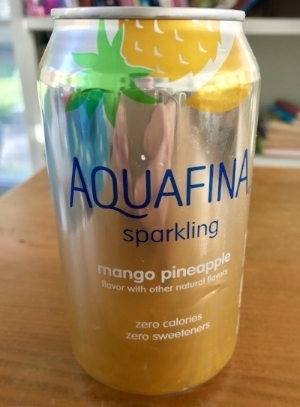 I love this mango pineapple sparkling water. I am not paid to say that! :) I just really enjoy my sparkling water. And if you know me, you know that is so true! This dish could easily be made with tofu as the protein and I will likely try that next time!